The Squamish, Tsleil-waututh and Musqueam people lived on the land around Killarney Secondary school in south Vancouver for generations. They were in the Fraser canyon region for 8000 years and in the area of Vancouver for about 3000 years, living in temporary villages along the Fraser River and ocean inlets. The aboriginal people hunted bear, deer and cougars in the thick forests and fished for salmon in the sea, river and streams. They traveled by large dugout canoes and walked on forest trails. Each Nation had its own culture and language and had complex economies, which included trade and potlatches with other First Nation groups. The aboriginal people encountered Spanish explorers for the first time in 1791 and the English in 1792. The mainland of what is now British Columbia became a colony of Britain in 1866 and joined Canada five years later. In 1886 the city of Vancouver was incorporated and a year later, the first train from eastern Canada arrived, bringing even more immigrants to the city. 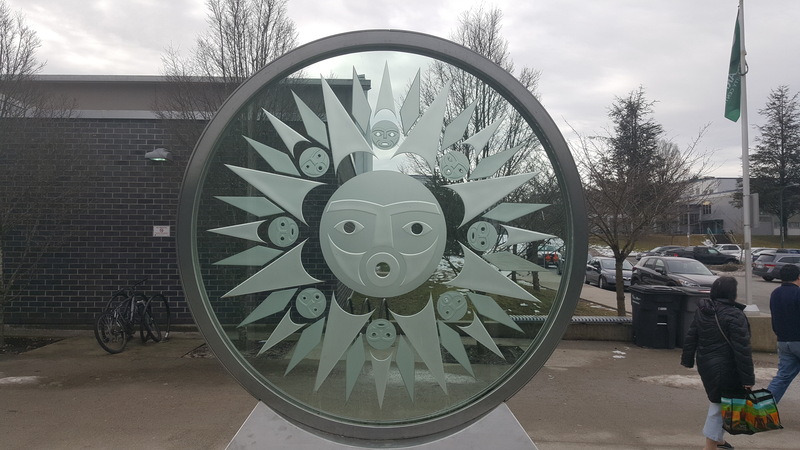 The forest trail used for generations by the Coast Salish people (ancestors of the Musqueam) stretches through New Westminster to 7th and Main Streets in Vancouver. This ancient route became a major road known as “Kingsway” in 1913. Today, there are more than 70 Killarney students who identify as having First Nations ancestry. The school also has a First Nations enhancement counsellor on staff.